NASA's ISS-RapidScat mission is expected to fly to the International Space Station at the end of September. NASA is gearing up to launch a landmark Earth-watching instrument to the International Space Station this month to help scientists track our planet's weather from space. 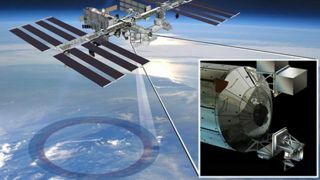 Called ISS-RapidScat, the new technology will be mounted to the outside of the space station to observe ocean winds and potentially aid in weather prediction and severe storm watching, according to NASA. The instrument is the first of many new Earth-monitoring instruments launching to the space station in the coming years. ISS-RapidScat will launch to the space station in two parts aboard the next SpaceX Dragon space capsule bound for the orbiting outpost. The robotic mission is slated to launch no earlier than Sept. 20. After launch and docking, two of the space station's robotic arms will assemble ISS-RapidScat on the outside of the station. The instrument is expected to collect data that will help people on the ground more accurately predict weather events. When working in concert with an Earth-gazing satellite called ASCAT, ISS-RapidScat will help provide coverage of more than 90 percent of the Earth every day, Ernesto Rodriguez, ISS-RapidScat project scientist, said Wednesday. NASA's ISS-RapidScat and CATS missions are expected to fly to the International Space Station in 2014, joining the 2012 ISERV Earth-gazing mission. That kind of daily monitoring is important because threatening storms — like hurricanes — need to be closely watched each day to provide forecasting information to people on the ground, Rodriguez added. ISS-RapidScat goes beyond better forecasts, however. The instrument could also help researchers learn more about how the energy from the sun, wind and ocean interact on a daily basis, Rodriguez said. There are currently 17 operational Earth-observing NASA missions flying today, and the space station provides a new avenue for Earth-centric science, space agency officials said. The station orbits at about 240 miles (386 kilometers) above Earth, but most Earth-studying satellites orbit about 400 miles (643 km) above the planet. It's advantageous that the space station has a lower orbit than most satellites, NASA scientists noted. "It has a different orbit than other Earth remote sensing platforms," Robinson said in a statement. "It's closer to Earth, and it sees Earth at different times of day with a different schedule. That offers opportunities that complement other Earth-sensing instruments in orbit today." The space station's lower orbit should help scientists using ISS-RapidScat get better equatorial coverage of the globe. Space agency officials are also planning to loft two other space-based Earth science missions to the station in 2016, and they are looking into even more Earth-observing missions for the future. ISS-RapidScat is one of five NASA Earth missions set to launch in 2014. Editor's note: This story was updated on Sept. 16 to reflect the new SpaceX launch target of Sept. 20.